NARS Velvet Matte Lip Pencil in Dragon Girl, £18.00. NARS Velvet Matte Lip Pencils are an old favourite of mine, and I think this was actually the first ever NARS product I bought. The Velvet Matte formula name says it all, these pencils give a perfect matte look with a comfortable, velvet finish. 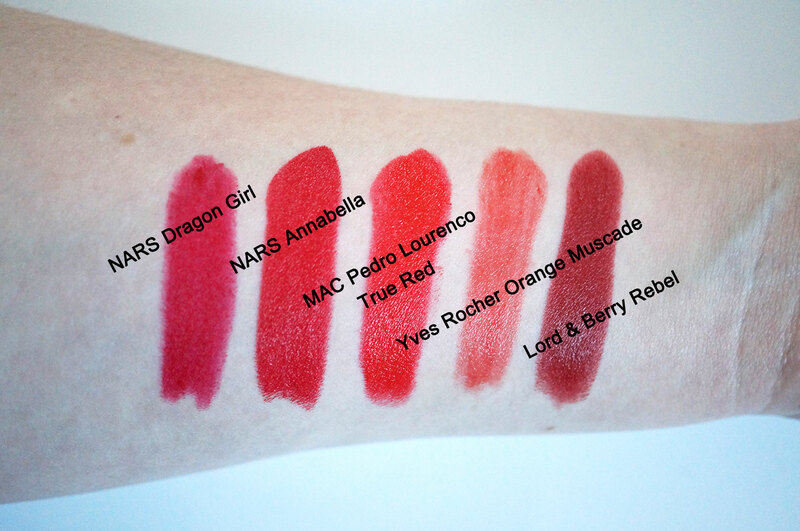 They’re definitely my favourite matte lip product. Dragon Girl is similar to Annabella below but ever so slightly less bright, and slightly more pink toned. MAC Pedro Lourenco Limited Edition Lipstick in True Red, £16.50. As soon as I saw the Pedro Lourenco collection I knew I had to get my hands on the lip products! 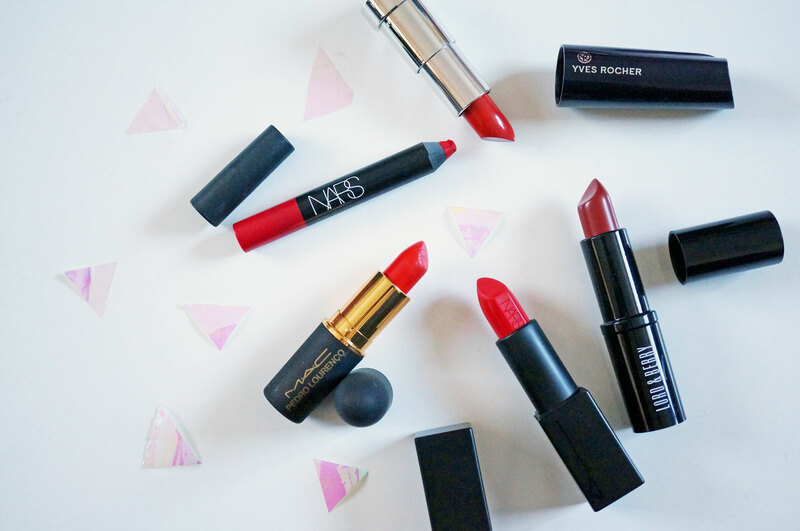 True Red is a bright orange-red that’s not for the faint hearted. It comes in an amplified finish, so the formula is super creamy, highly pigmented and long wearing. I love this shade! Yves Rocher Moisturising Cream Lipstick in Orange Muscade, £7.50. Yves Rocher’s Moisturising Cream formula gives their lipsticks a beautiful hydrating creme finish, that is super smooth and comfortable to wear. Orange Muscade is a semi sheer tomato orange, that’s great for a hint of colour to brighten the complexion. If you’re a bit scared of a full on red, I’d recommend giving this a go. Lord & Berry Vogue Lipstick in Rebel, £13.00. This is a new addition to my collection, and my first experience of Lord & Berry lipsticks. The Vogue lipsticks apparently have a ‘matte formulation with a velvet feeling and extreme comfort in application’. The Rebel shade is a deep brownish red, I’d say it’s quite a 90’s colour if you know what I mean. It definitely doesn’t have a matte finish though, it’s more of a creamy satin, but I’m definitely not disappointed. I love this Rebel shade for winter, it’s deep and richly pigmented and a great alternative to a bright red.